With a strong majority, 76% of respondents preferred Option A: The Unexpected Picasso. 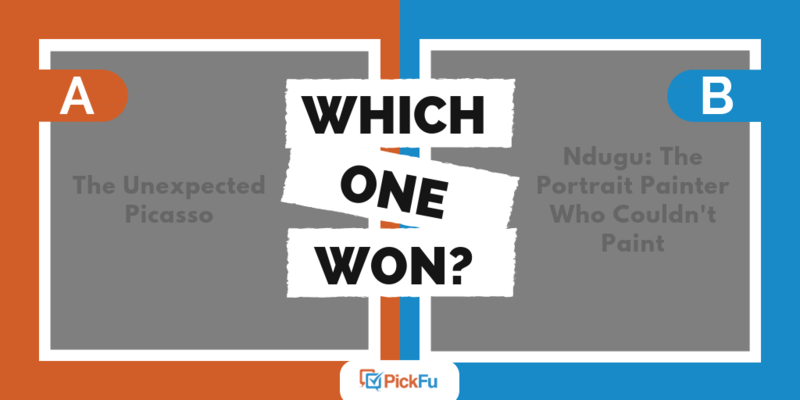 Out of 50 total responses, The Unexpected Picasso got 38 votes while Ndugu: The Portrait Painter Who Couldn’t Paint earned only 12. So why did the first title do so much better with the voters? Picasso is a household name, which means The Unexpected Picasso instantly brings up a feeling of familiarity with potential readers. Several of the respondents commented that the mention of Picasso was enough to spark their interest and make them curious about the book. When it came to Option B, many voters commented that Ndugu: The Portrait Painter Who Couldn’t Paint was too long and complicated for a book title. There was clear concern about the name Ndugu as well. Voters weren’t sure who Ndugu was or how to pronounce the name, so they immediately lost interest. Still, with only 24% of voters preferring Option B, it should make the question of how to choose a book title an easy one. This featured book title test shows there is a sweet spot between a short title and one just long enough to create interest. Get creative and clever with your title, but avoid words and names that aren’t well-known or easy to pronounce. Read more tips for book titles, create a list of potential names, and then test them out. Ready to test different titles for your own book? Start your own PickFu poll and see your results in just 15 minutes!